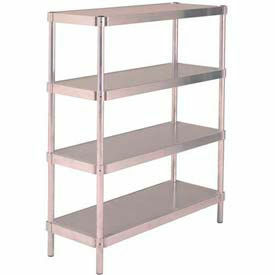 Aluminum Wall Mount Shelving Are Used For Warehouses, Industrial Areas, Mechanic Shops And More. Aluminum Wall Mount Shelving are made of all welded aluminum for long lasting durability. T bar style, 1-3/4" between bars. Shelf weight capacity is 700 lbs. per shelf. Dimensions vary. Limited Lifetime Warranty. Aluminum Adjustable Stationary Shelving Units Are Used For Restaurants, Warehouses Or Other Commercial or Industrial Storage Applications. Aluminum Adjustable Stationary Shelving Units are made of corrosion proof all aluminum construction for long lasting durability and dependability. Smooth, flat solid surfaces are easy to clean. 1/8 inch marine edge contains spills. Easy "lock bushing" assembly. 1-1/2 inch diameter heavy-duty round posts. Ships "Knock-Down" with easy assembly. 400 lb. capacity per shelf. Available in 24, 36, 48 and 60 inch lengths, 18, 20 and 24 inch widths and 24, 30, 48, 60 and 72 inch heights. 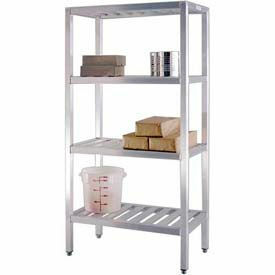 Cooler & Backroom Shelving Units Are Sanitary & Easy To Clean, Making Them Used For Food Industry Applications. Made using heavy duty, all welded aluminum for years of dependable service and rust resistance. Perfect for coolers, freezers and backrooms. Heavy duty square tube aluminum uprights with fixed height shelves. Shelves are available in 3-styles to fit your varying needs. 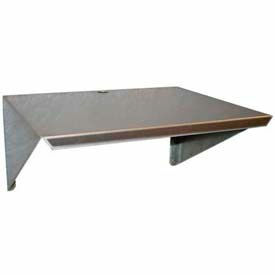 E-Channel Shelves are made of 4" x 1-1/2" E-channels inside a frame of tubular aluminum. Tubular Shelves are made of 1-1/2' x 1-1/2" cross tubes for improved air circulation. T-Bar Shelves is made of 1" x 1-1/2" T-bars spaced 2" apart. Allows boxes to slide on and off easily. NSF® approved. Aluminum Adjustable Mobile Shelving Units Are Used For Restaurants, Warehouses Or Other Commercial or Industrial Storage Applications. Aluminum Adjustable Mobile Shelving Units are made of corrosion proof all aluminum construction for long lasting durability and dependability. One-piece solid sheet adjustable shelving can be configured to particular needs. 1/8 inch marine edge contains spills. Easy "lock bushing" assembly. Heavy duty Stem Casters (2 locking, 2 swivel). Ship "Knock-Down" with easy assembly. 400 lb. capacity per shelf. Available in 20 and 24 inch widths, 36, 48 and 60 inch lengths and 54 and 66 inch heights. Aluminum Slotted Shelf Wall Shelving Is Used For Restaurants And Other Commercial or Industrial Handling And Storage Applications. Aluminum Slotted Shelf Wall Shelving is made of corrosion proof all aluminum construction for long lasting durability and dependability. 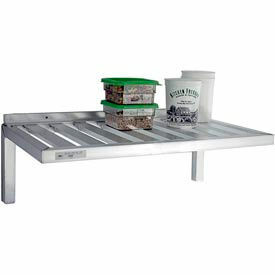 T-Bar style shelves allow for air flow and dries pots and pans quickly. Heavy-duty tube frame with 2-1/8 inch wide T-Bar slides. Weight capacity is determined by wall anchors. Includes 3 Stainless Steel pot hooks. 20 inches deep. 15-3/4 inches in height. Available in 24, 36, 48 and 60 inch lengths. 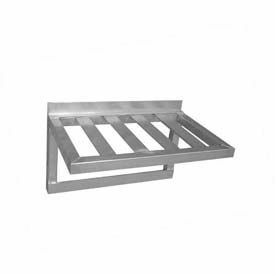 Aluminum Microwave Solid Wall Shelving Is Used For Holding Microwaves or For Numerous Other Commercial or Industrial Storage Applications. Microwave Solid Wall Shelving is made of corrosion proof all aluminum construction for long lasting durability and dependability. Easy to clean design. All welded corners. 1-1/2 inch backsplash. Ships "Knock-Down" with easy assembly. Pre-drilled gusset supports. Each support mounts with only 2 fasteners. Available in 24, 36, 48, 60 and 72 inch lengths. Aluminum Heavy Duty Racks Are Used For Warehouses, Industrial Areas, Mechanic Shops And More. 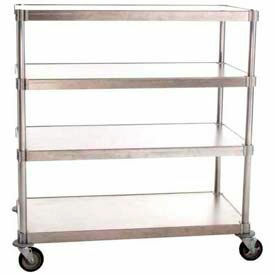 Aluminum Heavy Duty Racks are made of all welded bar style aluminum for long lasting durability. 2 shelf limit. Shelf weight capacities are 1000 or 1500 lbs. per shelf. Dimensions vary. Limited Lifetime Warranty on construction and against rust and corrosion. 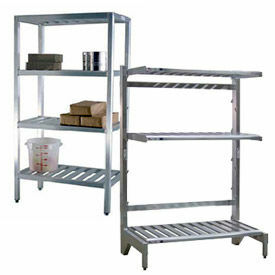 Aluminum Adjustable Shelving Is Used For Warehouses, Industrial Areas, Mechanic Shops And More. 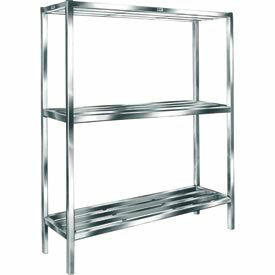 Aluminum Adjustable Shelving is made of all welded aluminum for long lasting durability. Square bar style. Shelf weight capacity up to 2000 lbs. per shelf. Dimensions vary. Limited Lifetime Warranty.